WEST LAFAYETTE, Ind. — Imagine spending an entire year in space, away from loved ones and family. What happens to your body, your mind and your well-being? And, what can you learn about leadership and teamwork through the experience? 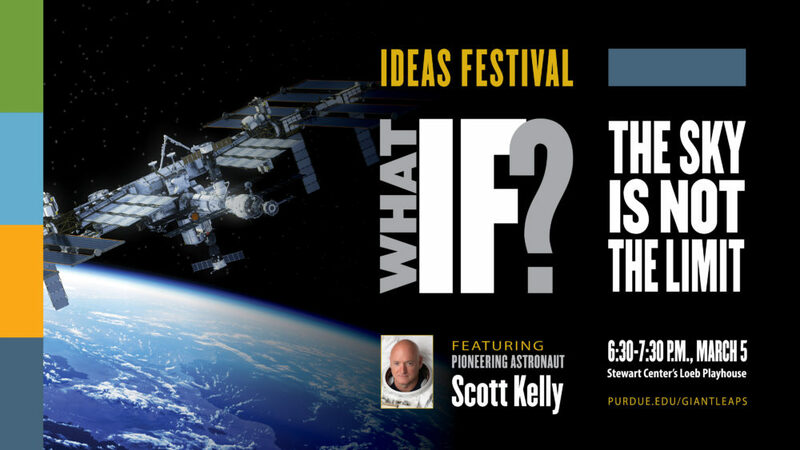 Astronaut Scott Kelly will present “What IF the sky is not the limit?” on March 5 to share his insights into the leadership and teamwork necessary to survive for a year in space and the demands involved with separation from loved ones and planet Earth. With his awe-inspiring stories from space and personal reflections, the former NASA astronaut inspires others to believe that they can reach any goal, no matter how ambitious or audacious. The event is a part of Purdue’s Ideas Festival, the centerpiece of Purdue’s Giant Leaps Sesquicentennial Campaign, which is a series of events that connect world-renowned speakers and Purdue expertise in a conversation on the most critical problems facing the world. One of the Ideas Festival’s themes is Giant Leaps in Space. The event is sponsored by the Purdue Honors College and Purdue Polytechnic Institute. The talk, which is free but will require tickets, is 6:30-7:30 p.m. in Stewart Center’s Loeb Playhouse. Tickets are available online or in-person at the Stewart Center box office starting on Feb. 4. There will be a book signing with Kelly in the Stewart Center lobby following the speech. Kelly, a 20-year veteran of NASA, spent 520 days in space over four missions. His missions included serving as the commander of the International Space Station from March 2015 through March 2016 during his record-setting year in space. On this mission – together with his identical twin brother, Mark, who remained on Earth – Kelly paved the way for the future of space travel and exploration as part of an unprecedented NASA study on how space affects the human body. The Honors College also will host Kelly for a panel discussion as part of the second-annual Aronson Family Science and Society Honors Lecture Series at 4 p.m. on March 5 in Honors Hall. Along with Kelly, this panel features Purdue professors Briony Horgan from the Department of Earth, Atmospheric, and Planetary Sciences and Marshall Porterfield from the Department of Agricultural and Biological Engineering. The Aronson Lecture Series provides a venue for students, faculty and staff to have meaningful conversations about technological innovations and their roles in our society. A Q&A session will follow the panel discussion. A reception featuring “space food,” courtesy of Purdue Dining, will precede the panel discussion. Tickets for the Aronson Family Science and Society Honors Lecture Series are available to Honors College students here. Along with his time in NASA, Kelly’s career includes serving as a member of the United States Navy (1987-2012). His memoir “Endurance: My Year in Space and Our Journey to Mars” is a New York Timesbest-seller.